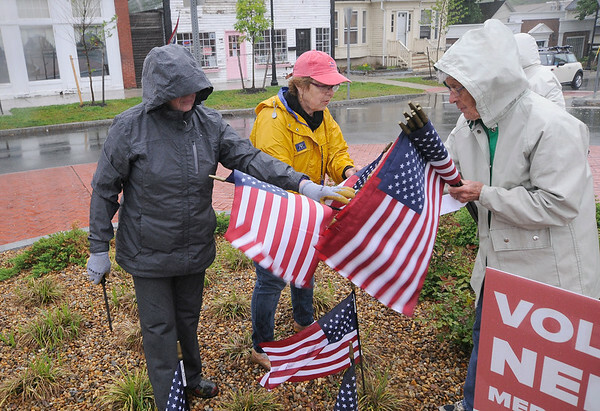 JIM VAIKNORAS/staff photo Merrimac Garden Club Members Carolyn Force, Janet Lavoie,and Thelma Gibbs put out flags in the rain puts in flags in the rain in Merrimac Square Friday. Each flag contained the name of a veteran, and was placed for a $10 donation with proceeds going to Veteran's Services. The flags are reusable and will be placed ever year before Memorial Day. Also there, not shown are Susan Barbrick and Sandy Venner.